This article demonstrates how to create and use a user property in SharePoint Online (O365). This article demonstrates how to create and use a user property in SharePoint Online (O365). This article starts with introduction of the UserProfile Service. After that, it will demonstrate how to work and play with User Profile Service. A user profile is the collection of user properties that describe a single user. The properties include basic user details, policies, and settings. Most of the organizations find it a big headache to maintain User Profile properties in efficient way which is necessary because it helps people to find content that connects them with other people. And by User Profile Properties, you can learn a lot about a user and connect with them using social features, like blogs and dicscussion. From the Office 365 directory service, the default user properties are derived to UserProfile Service. 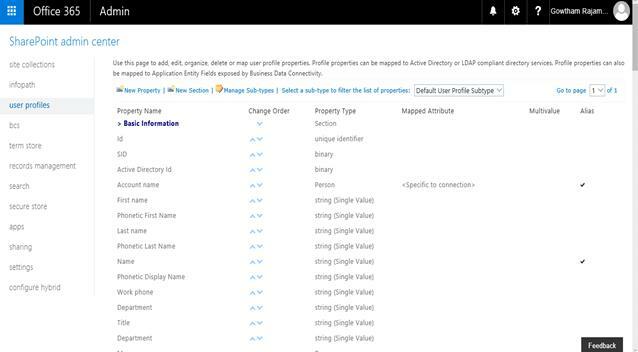 The admin from SharePoint Online can enhance the SharePoint capabilities by adding user profile properties, defining user policies, and creating audiences. Here are the basic screenshots I have added to demonstrate how to access the USerprofile Service in SharePoint O365. 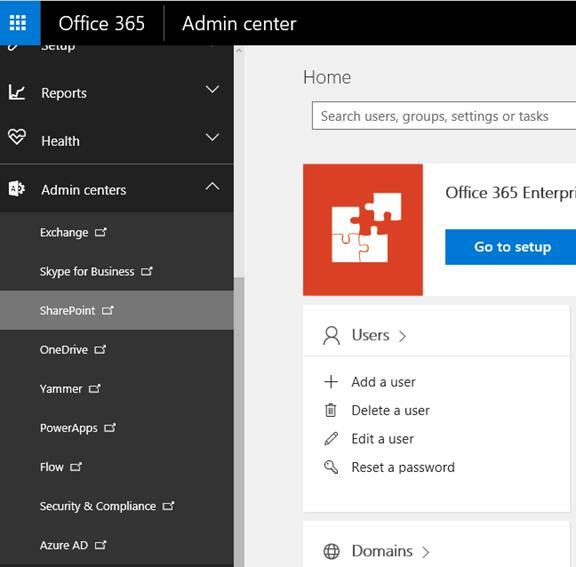 Login with your trial/original version of O365 and click the Admin Center. After this, you will get the new screen.Then, click the SharePoint link for redirecting to the below screen. User profiles can be the base of your existence or one of the big wins for your organization. There are three important sections in a user profile, which we will discuss one by one. In People section, Admin can manage all user properties and profiles.They can provide the permissions for audience here. This section is for managing an organization's details. This is totaly for MySite related topics. My Site is essentially a personal portal that gives individual users the ability to have a one-to-many collaboration path with the enterprise. Now, we will see about "Manage User Properties" section in this article. Click the "Manager User Properties" link under the "People" heading and you will be redirected to the below screen. The basic default properties are available under this link and here, you can use this page to add, edit, organize, delete, or map user profile properties. Profile properties can be mapped to Active Directory or LDAP compliant directory services. 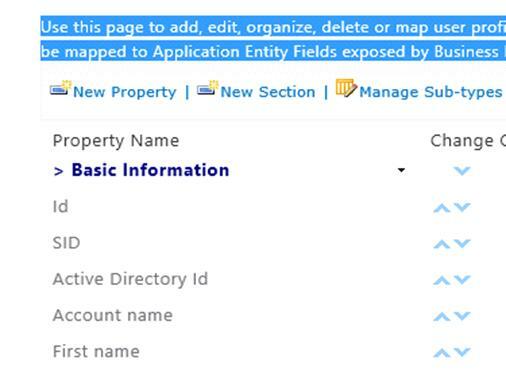 And also, these properties can be mapped to Application Entity Fields exposed by Business Data Connectivity. Here, you can create a new user propery and new section. Those details will be explained in the next article. Office 365 SharePoint Online does not automatically sync user profiles with SharePoint Online. We have to visit a SharePoint site, then only the profile will be synced to SharePoint Online during the next scheduled Office 365 directory service sync. The above article helped you to understand the basic topic of how to access the SharePoint Online User Profile Property.